If unable to open the document, please Click here to Install Adobe Reader on your computer. Once you have Adobe Reader, you should be able to read any PDF document on this web site. A Multileaf Collimator is now available as an optional accessory for the Equinox™ product line, providing 3D Conformal Radiation Therapy (3D CRT) and Intensity Modulated Radiation Therapy (IMRT) capability. 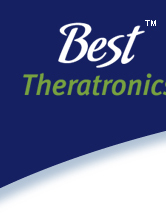 The Best Theratronics Multileaf Collimator 60 (MLC 60) is custom designed for seamless integration with the Equinox 100 therapy machine. The Equinox™ MLC 60 system is the most advanced Cobalt Teletherapy system available.